Death of a Bee Balm? My husband’s birthday was a couple weekends ago so we went away to visit our family and celebrate. I had recently brought in some of my potted herbs since the frost is becoming more intense each evening. Upon returning, I found that my bee balm, once flourishing and green, had been practically sucked dry by aphids! Ugh! 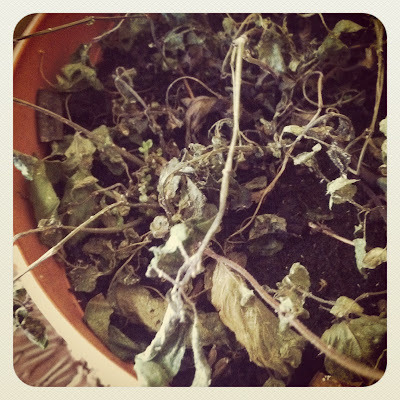 I was very sad and tried to remove the pests but a majority of the plant has died. I always feel awful when this happens. Why didn’t I do a thorough examination of the plant before brining it in? I grew my bee balm from seeds purchased from Alchemy Works. I had been wanting to grow some for a few years. My grandmother introduced me to the plant when I was very young so there’s a huge nostalgic draw. She has them in her garden and used the blossoms in her pressed flower works. They are a lovely bright red and look stunning in art. As the name hints, they’re a favorite of pollinators. I’m always striving to improve my garden and make it more hospitable to bees, butterflies, and humming birds. Finally, as a tea drinker, I was attracted to bee balm’s history in Colonial America. Following the tea taxes, Colonials took to brewing bee balm, nicknamed “Oswego Tea,” as a substitute. Apparently it is very similar tasting. I was hoping to try some soon but… Alas. However, as you might be able to see in the photo I took, there is some small growth. I’m very hopeful the plant can bounce back. I need to create a good spray of garlic and cayenne peppers to combat the aphids… especially before the hubbub of the holiday season! I’ll have to see if I can fit that in between baking rolls and cooking cranberry sauce. Thank you for your comment! That’s what I was thinking about the roots. Thankfully we live in the North Country and the humidity only really strikes for a couple months each year. Right now it’s just cold, cold, cold… I hope my bee balm is back to its lovely self soon! I am sure that it will be. All the best. Ahh, the dreaded aphid! I did battle with them last summer when I found them sucking the life out of my ornamental plums. I found online that if one just gives the whole plant, being careful to spray UP , underneath the leaves as well as over the top with water, a good hit with the hose, it blasts the little suckers to the ground with broken jaws..made me somewhat ill to think of the thousands of them laying on the ground in agony with broken jaws, but if it was the plums or the aphids…not sure if it broke their jaws but it sure did the trick! I just took the garden hose and put my thumb over the end and let ‘er rip! Definitely a good sounding, environmentally-friendly method to be sure! I don’t know if I could easily do this now that the temperatures have dropped… I wonder if the sink would do the trick? Diluted dish soap works great to kill aphids and milk is best for getting rid of the mildew it looks like you might have a touch of. They do die back this time of year anyway. In spring buy some ladybugs and put them in the refrigerator until night then put them out. The chill will encourage them to stay in your yard and not fly to your neighbor’s. Best of luck for your little green one! My mint didn’t make it by the time I brought in the ones that would over winter. I’ve got my rosemary, lavender, oregano and aloe. It’s a battle to keep the cats away from them some days though!